Many people ask about the inspiration behind the logo of Once Upon a Room. It is one of my favorite stories to tell because every time I share it I get to remember myself that special day with a very heroic patient…. As we arrived outside of Caleab’s room we were greeted by a very tearful grandmother who was Caleab and his 3 other siblings’ primary caregiver. 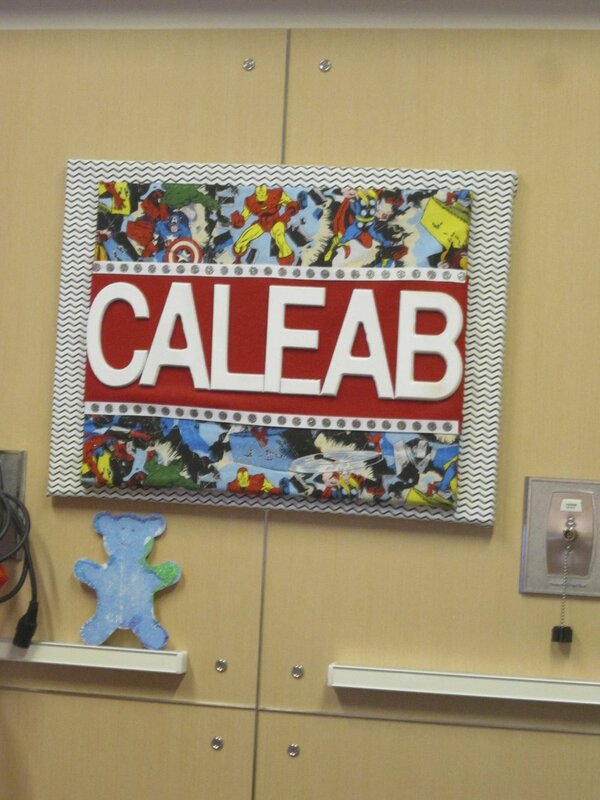 Caleab has been in the hospital for an extended period of time with Leukemia. Grandma told me that this wasn’t a good day because for the past 3 days they couldn’t get Caleab to eat much, get out of bed or even crack a smile. She felt like he was just getting tired of being sick and having to fight so hard. Breaks your heart to hear the pain from this loving woman. We asked her to just get Caleab to the playroom for 30 minutes and we would try to brighten his spirits. So off they went and in we came with a wagon full of superhero paraphernalia. We needed to find the superhero in Caleab so he can unlock his magic powers to keeping fighting this cancer monster. The nurse and Child life specialist went to bring Caleab and grandma back to the room. As the door opened in bounded the most energetic 7 year old boy with a smile on his face that shined throughout the hospital. Forgetting about the IV pole with many medications attached to it, he leaped up on his bed, threw his hands in the air and yelled, “It’s like magic!! !” He kept repeating, “room lady how did you do it? It’s like magic!” Needless to say there were tears all around. Caleab was racing around his room completely forgetting the reason he was in there in the first place. This had certainly unleashed his superpowers that I think he forgot he had. The patients may think it is magic, but they are truly the magic in our lives. As our tag line says, every child has a story, is so true. Caleab, thank you for letting us be a small part of your story. You are our superhero! !